Regular observations of material transport by the rivers of Northern Eurasia began at the beginning of the 20th century and substantial information has been accumulated and analyzed. According to the latest estimates (Lvovich et al., 1991), sediment yield from the whole territory of the FSU is 716 million tonnes a-1, 77 and 639 million tonnes originating from European and Asiatic areas, respectively. 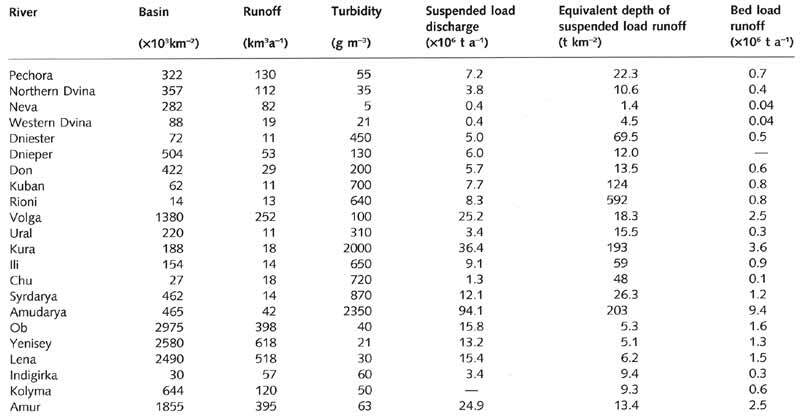 In Asiatic rivers, suspended sediment load is usually higher due to the higher erosion rates which amounts to 61 tonnes km2 in Asia and 15 tonnes km2 in Europe (the highest erosion rates of 560 tonnes km2 occur in the Caucasus mountains). For comparison, the global total sediment discharge is 14.9 x 109 tonnes a-1 while erosion rate averages 118 tonnes km2 (Lvovich et al., 1991). With respect to discharge of suspended sediment, four zones are distinguished in Northern Eurasia (Shamov, 1949). Typical of the first zone, which covers mainly northern areas, are small loads which usually do not exceed 50 g m-3. Sediment loads in the second zone, to which the forest-steppe and parts of the forest zone belong, vary between 50 and 150 g m-3. The third zone is distinguished by high sediment loads which may reach 500 g m-3. This zone extends across the steppe regions of the European part and Western Siberia and high suspended sediment yields form in response to a very high proportion of arable land which in some European regions exceeds 80 per cent (see below) and which produces high erosion rates. In all three zones (with the exception of the Far East where the summer maximum is observed) transport of suspended load peaks during the spring floods when its values exceed those observed during the period of low water by a factor of 10-30. On average, during the spring floods rivers transport up to 80-90 per cent of the annual total. The fourth zone, covering the mountains of the Caucasus and Central Asia, is distinguished by very high sediment loads (500-5000 g m-3). During floods, sediment load may reach 100 000 g m-3. Mud floods are frequent here. Values of the specific sediment discharge, which is a good indicator of erosion rates, vary between less than 5 tonnes km2 in the north and 500 tonnes km2 in the southern mountains. 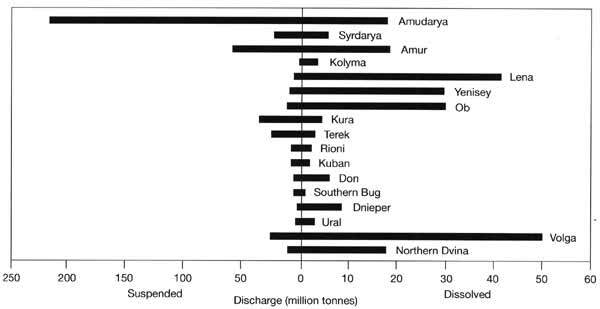 The Amudarya has the highest specific sediment yield followed by the Kura and the Volga (Table 5.3). Sediment yields in rivers like the Volga, which has many dams and reservoirs, have been reduced in comparison with what they would have been in the absence of such structures. In most rivers of Northern Eurasia, water has low mineralization. In rivers, draining about three quarters of the whole territory, mineralization is lower than 200 mg l-1 (Alekin, 1970; Nikanorov, 1990). Across large areas of the European north and Siberia, which have abundant moisture supply and flat terrain, it is lower than 50 mg l-1 and these waters belong to the carbonate type. Rivers with sulphate and chloride types of mineralization drain approximately 10 per cent of the territory and are concentrated mainly in the southern steppe. Alekin (1970) estimates that the total annual ionic discharge by rivers of Northern Eurasia averages 384 million tonnes which is nearly two times less than the total sediment discharge (as estimated by Lvovich et al., 1991). The transport of organic substances averages approximately 80 million tonnes a-1 and those of mineral colloids and organic biogenic elements are about 20 and 2 million tonnes a-1, respectively (Alekin and Brazhnikova, 1964). With respect to regional patterns of partitioning between suspended and dissolved load, dissolved load dominates in rivers draining forested plains. Between 65 per cent and 85 per cent of all load carried by the rivers of the forest zone is dissolved load while in the forest-steppe and steppe its proportion declines to 40-50 per cent (Figure 5.7). In those rivers which originate in the mountains and flow through the desert, such as the Amudarya, the opposite is true. Rates of chemical weathering, which lead to solute production, are relatively modest, whereas erosion rates, which produce suspended material are relatively high.